This is the third book in the "House of Niccolo" series. Set in 15th-century Cyprus, this novel continues the saga of Nicholas van der Poel, international mercenary who started out as a dyer's apprentice, as he plays for the highest stakes with the greatest super-powers in Europe. 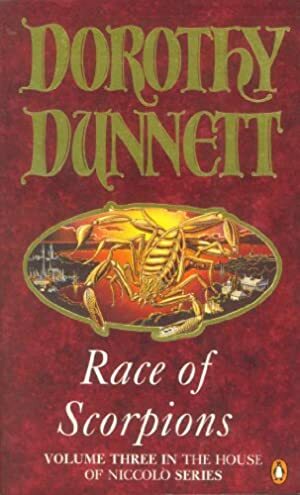 Log In to track Dorothy Dunnett on eReaderIQ. to be notified each time the price drops on any book by Dorothy Dunnett. to stop tracking Dorothy Dunnett. We started tracking this book on July 20, 2012. The price of this book has changed 20 times in the past 2,470 days. The current price of this book is £4.99 last checked 7 hours ago. The lowest price to date was £4.31 last reached on December 28, 2013. This book has been £4.31 one time since we started tracking it. The highest price to date was £11.99 last reached on October 19, 2012. This book has been £11.99 one time since we started tracking it. We last verified the price of this book about 7 hours ago. At that time, the price was £4.99. This price is subject to change. The price displayed on the Amazon.co.uk website at the time of purchase is the price you will pay for this book. Please confirm the price before making any purchases.